As the holidays wind down, conversations turn to New Year’s Resolutions, those pesky promises seemingly made to be broken, such as getting in shape, saving money, or cussing less. These are all great ideas, but as boaters with spare time on our hands this season, here’s a better idea: skip the resolutions and make boating plans. Here are our top 10 ways to get on the water more in 2019. For ideas on specific cruising destinations, visit our See the Bay page. While a lot of people around you begin dieting January 2, you should head to the kitchen and make some yummy comfort food—because that’s how you lure your boating friends to your house to make summer plans. Spaghetti, lasagna, chili, oyster stew, seafood gumbo: whatever it takes to bring friends together. Putting some summery music on in the background will set the tone as you cook. Some boaters only make seasonal plans with their first mates, but many others go boating with a larger group of family, friends, slip mates, or club members they may only see in the summer months. Invite them to your house for an official comfort food feast and summer boating planning session. 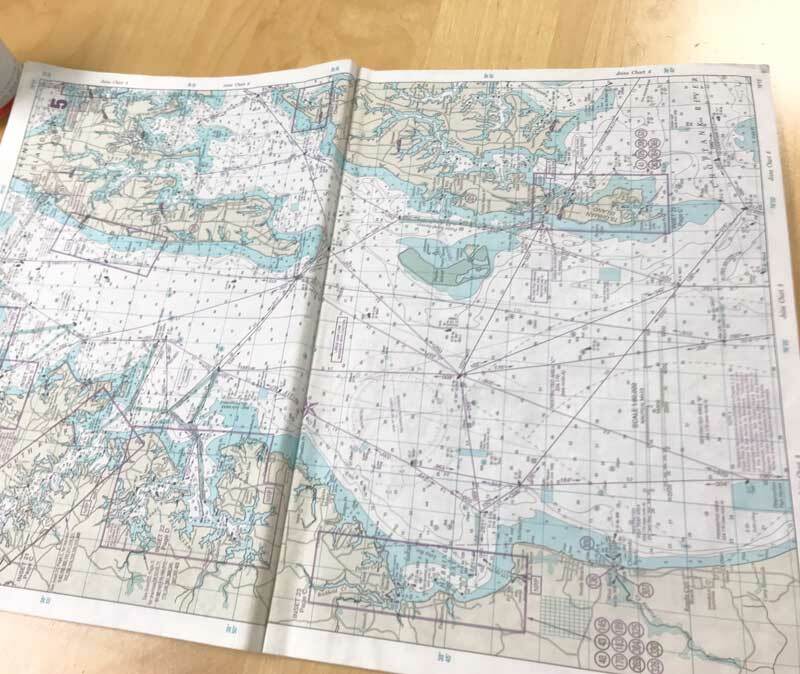 Although you could always pull a chart up on your computer, there’s something about laying out a paper nautical chart of a favorite cruising area on a table that brings boaters together. The Chesapeake Bay is endlessly fascinating even to those who know it well. If you have a chart or a cruising guide on which you can make marks with a highlighter of creeks, anchorages, and destinations you’ve been to and perhaps places you’d like to go to, that will spark the dialogue. Bring a paper chart and gather boating friends together. For many, this means a smart phone, but some of us still work with paper calendars and planners. Bring your organizational tool of choice. When a dream of going to a particular place gets penned onto (or plugged into) a calendar, it’s more likely to happen. Before you show up at dinner with your calendar, check with your family about 2019 graduations, family and school reunions, and weddings to make sure you get them on the schedule before you start adding in boating fun. 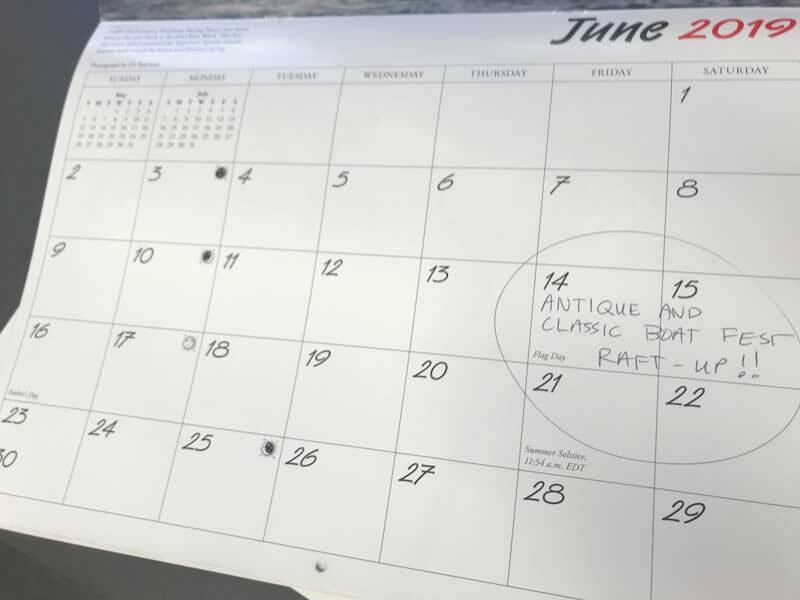 It’s not easy to schedule boating adventures in January, but we guarantee your schedule is more open now than it will be in June! List creeks, towns, or anchorages on the Chesapeake where you’d like to visit by boat. They don’t have to all be new to you; it’s okay to love a place so much that you go back again and again. This is a planning session after all, so jot down any place that would make for a happy summer journey… and that may include a nearby creek. Classic boats, maritime heritage, music, oysters, craft beer, and pirates—there are festivals on the Chesapeake for all of them. Sometimes the dates do not yet reflect the 2019 dates, but the larger festivals have set their schedules, so check the event websites, too. Baltimore Orioles fans who like to travel by boat will be happy to know that the 2019 schedule is up online. Look up maritime festivals and fun waterside events and actually mark them on your calendar so that you don't forget them. While perusing a nautical chart on a coffee table (especially after a big meal and an adult beverage or two), it’s easy to think you can conquer the entire Chesapeake in a weekend. Remember, the Bay measures 200 miles long. How fast does your boat go? When gauging your distances for 2019 travels, be realistic. You don’t want to find yourself 100 miles from home on a choppy Bay on a Sunday night when you have to get to work by Monday morning. If you know a trip is a stretch distance-wise for your boat and/or your crew experience level, plan it as a weeklong vacation or extended weekend. Ask more experienced mariners what they think of your plans. Be prepared to scale them back to a more realistic, and perhaps more enjoyable trip. You’re probably not going to plan your entire summer in one sitting (some spontaneity is fun! ), but if you pen three or four weekend escapes on the calendar, you’ll be happy you did. Having something to look forward to in spring and summer makes the winter more bearable. Also, when the weekend is blocked off, household chores, lawn care, or work won’t seep into the weekend calendar gap. 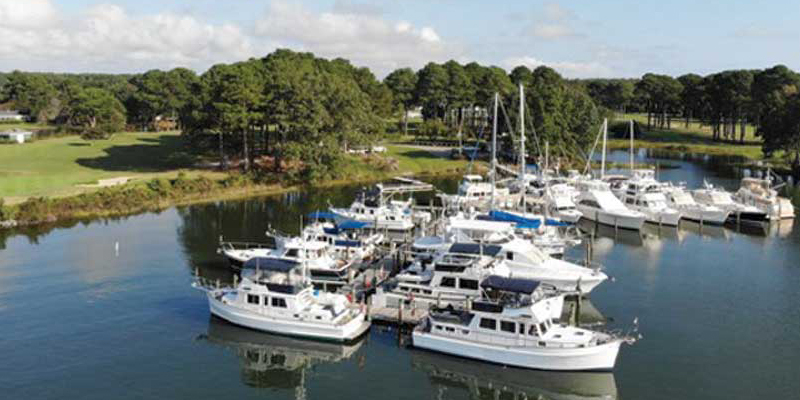 Big marinas such as Herrington Harbour North and South and other resort marinas accept transient slip reservations as early as January 2. If your plans involve docking at a marina, why not make your slip reservations now? Somebody gets the good slips on Memorial Day, the Fourth of July, and other busy weekends; it might as well be you. Now that you have definite plans to get under way with good friends on your boat and something to daydream about, get to work varnishing that woodwork, recovering those tattered cushions, or any other boat project you’ve saved for these quiet winter months. If you don’t have any boat projects, maybe you can join the New Year’s resolution crowd at the gym!